Wire EDM (Electrical Discharge Machining) is a computer numerical controlled (CNC) machine that uses an electrical current to cut metal. These machines use a .010 of an inch diameter wire, that can be made of copper or brass, to conduct the necessary electrical current used to eviscerate dust sized pieces of the metal block it is cutting. Along with the brass or copper wire, wire EDM machines also require a constant flushing of dielectric water to help control the sparking coming from the brass wire, control the temperature of the electrical current, and flush out the cut material. Most EDM jobs require the cut to start on the outside edge of the part, or within an existing hole in the part. Wire EDM machines use either a copper or brass based wire to conduct the electrical current that actually cuts the metal part. 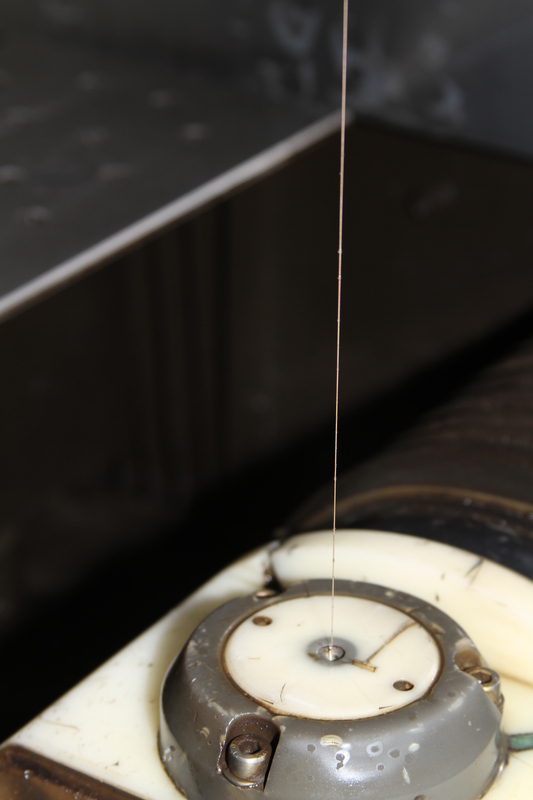 By using an electrical current to cut material, the tolerances that these machines can keep are incredibly precise. Most wire EDM machines can hold up to .0005 of an inch tolerance. Because of the tight tolerances they can keep, these machines are the best option for cutting hardened tool steel for tooling and die components, and other tight tolerance custom manufacturing projects. Wire for our wire EDM machine feeding into the lower head. For more information, you can visit our wire EDM page. For direct contact, you can find our phone and email contact information here. This entry was posted in Wire EDM on July 31, 2013 by johnatmetalproducts.